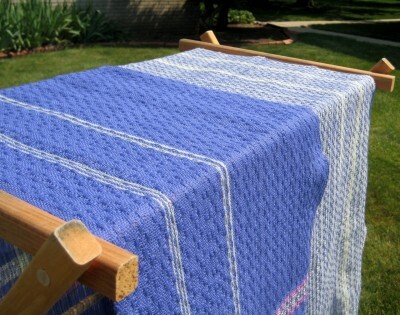 I did a photo-shoot for Jackie this morning, taking some pictures of her new fabric fresh off the loom. As I type this, she’s preparing to wind a warp for another piece of fabric to go with this one. As I understand it, she’s making three difference pieces of fabric with three different weave structures, but all three made out of the same cotton yarn. Then she’s planning to use the fabric to make a blouse. I expect Jackie will be posting on her new fabric shortly, with additional photos. So if you’re interested, keep an eye on her blog.